Wives and Girlfriends of Sports stars, they turn heads as much as their famous hunky husbands/boyfriends do and Erin Osweiler (nee Costales) who on February 28th, 2015 tied the knot with former Denver Broncos quarterback Brock Osweiler is no different. The world is so much interested in the lives of women like Erin that a name (WAGS) was even coined to describe them. By just being married to any pro athlete out there, you’re officially a celebrity. While some chose to stay right out of the spotlight (like Erin), others welcome the fame with arms wide open and even capitalize on it to boost their fame further. Erin Osweiler may be one of the quiet ones, (yh! she’s really privy even her Instagram account is “private”) but there are still some facts about her worth-knowing, so let’s get right into dishing them out. 1. Erin has been with her NFL star beau right from the start of his career. Yup! She has been cheering him up long before the NFL cheerleaders. The duo met before Brock’s NFL debut in 2012. As the story goes, they were set up by a mutual friend and it wasn’t long before they began dating. Brock took the relationship to the next level when he popped the question to her in their Scottsdale home. “It was incredibly sweet, perfect, and from the heart,” Erin describes the moment when Brock got down on one knee! 2. It rained on their wedding day, but the couple still had a splendid wedding party. 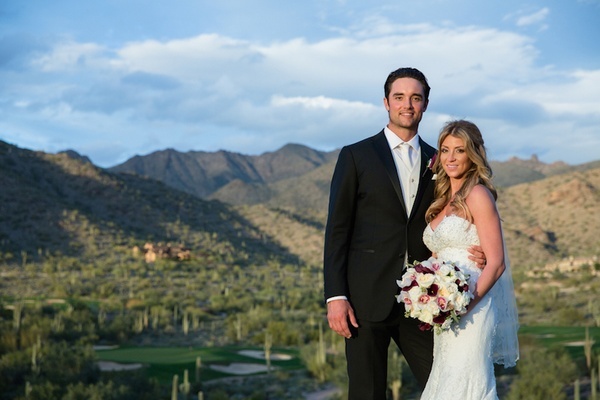 Erin and Brock wanted their wedding to be at their dream wedding venue – Silverleaf Club in Scottdale, Arizona. They employed the services of wedding planner, Amy Mancuso and she was sure to deliver. When an unexpected rain came pouring down, Mancuso had it all covered as she had a backup tent erected to serve all 120 guests so the outdoor nuptials could continue. “Our wedding planner saved the day!” Erin confessed to Insider Weddings. 3. About two years, after their wedding, they welcomed their first child, a daughter named Blake Everly Osweiler. Erin and her husband love kids, we can tell as they love visiting sick children – a trip to the latter’s Instagram page reveals it all. So we were expecting theirs to arrive soon. In late 2016, TMZ reported that Erin was baking her first baby who would be due in April of 2017. And it came to pass on the 9th of April 2017 when Brock took to his Instagram page to reveal their new addition, a healthy little girl they named Blake. He has since been flaunting photos of her on his page. And then there was 3…Welcome to the world Blake Everly. 4. Mr. and Mrs. Osweiler had a little encounter with some haters in Scottsdale sometime in March 2016. The Osweilers were out having a good time in a pizza shop called Joe’s Pizza in Scottsdale at about 2 AM on a Saturday morning when some group including a man and woman heckled them. The lady was approaching Erin aggressively when Brock pushed her away, in retaliation the man shoved Brock in the back but the NFL star turned away and guided his family safely into the car and zoomed off. It wasn’t clear what caused the situation, but Brock did a good thing to walk away. Policemen at the scene later confirmed that no crime was committed. Also no one pressed charges. TMZ has a footage from the night. 5. Erin isn’t only a pretty face, she happens to know a lot about football. She even helped her husband learn the Texans’ playbook after he signed that massive $72 million contract that would, unfortunately, become short-lived. A few weeks after the Pizza shop situation, Brock inked a $72 million pact with the Houston Texans after which he was faced with the task of learning the Texan Offense. Well, with his helpmate around, it wasn’t going to be too difficult for Brock to pull through. After learning what the 18-page booklet had to say, Brock practiced with Erin who acted as the offensive coordinator, while reading him the full play.